deadmau5 at Studio Paris, summer 2012. DJ deadmau5 performs at Studio Paris, summer 2012. 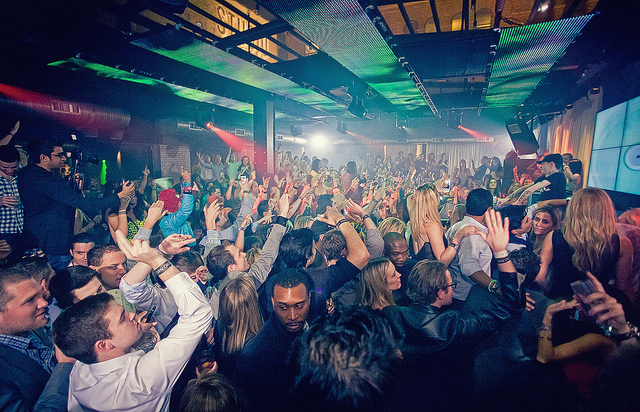 At the risk of sounding like Stefon, Chicago&apos;s hottest club is...someplace unexpected. Maybe you&apos;re not a "club person," but serendipitously find yourself dancing the night away at Danny&apos;s and having the time of your life. Perhaps your loyalty lies with Enclave or The Apartment, but a "Secret Disco" DJ set at Maria&apos;s Packaged Goods & Community Bar takes you by surprise. Of course, the options for dance-y bars and clubs in Chicago are seemingly endless—Smart Bar, The Mid, Roscoe&apos;s, Studio Paris, Neo, Berlin, Spy Bar, Rainbo Club, Late Bar, Club Foot, The Shrine, Beauty Bar, etc.—and the crowds differ in personality from one neighborhood to the next. But whether you&apos;re out in Bridgeport or Boystown, River North or Ukranian Village, objectives stabilize at a universal constant: drink, dance like there&apos;s no tomorrow, and find somebody with which to do both of these things in very close proximity (and then some). I&apos;ve seen the heady combination of alcohol, dubstep and strobe lights bring out the worst in people; but regardless of whatever form your music-and-dancing adventure may take, the experience doesn&apos;t have to be a painful one. In fact, grooving to Prince or Avicii in the blast of expertly-timed lazers and fog machines could become your new favorite way to spend an anything goes kind of night. Be nice to the bouncers. The Golden Rule is a great life philosophy in general; but if applied to bouncers, could produce some immediate karmic wins. When told to form a line, agree with a smile. Cutting to the front or loudly complaining about the wait will not get you anywhere; in fact, behaving like an arrogant jerk could get you thrown out or even blacklisted (trust me: they will remember you for making a scene). Remember that bouncers have a job to do; and if you make that job easier for them, then you will be rewarded. I get the impression that bouncers, bartenders, and other bar staff are not particularly thrilled about serving hundreds of drunk clubgoers at 2 a.m. on a Saturday morning, so above-average tips often go a long way. Other simple courtesies, like knowing which shots you would like to order before flagging down a bartender, could result in both quicker service and stiffer drinks. Obviously, staying out of personal "bubbles" can be bit difficult in a packed crowd with little room to breathe, let alone maintain a modest distance. Most club layouts are also specifically designed to squeeze as many sweaty, lustful people together as possible, whether they be out on the dance floor or waiting in the halls. Still, no matter how uncomfortably close you are to the people around you, there is no excuse for being the phantom grinder: the person who creeps up behind an unsuspecting stranger and starts grinding without their permission. If you want to dance with someone, ask—or at least make some "How about it?" eye contact. If someone is grinding up against you without your consent, either turn around and call them out for being creepy or casually shuffle away. Some people can dance all night in high heels without tripping constantly, and that&apos;s awesome. If you are not one of those people, swallow your pride and wear flats. And if you don&apos;t want to be mercilessly stabbed by stilettos on the dance floor, make sure that those flats are closed-toed. Find the best fit for you, and embrace it. Do you enjoy EDM (house music, techno, trance, hardstyle, etc.) or would you rather dance to cheesy throwbacks like Madonna and Depeche Mode? Perhaps you prefer mosh-dancing to punk shows at the Empty Bottle, or hanging out in dive bars with no dancing at all. Not everyone enjoys busting a move on the dance floor; but if you&apos;ve never experienced the diversity that Chicago&apos;s club scene has to offer, then what&apos;s the harm in finding a slice of nightlife that works for you? Be a friend to whichever bar or dance club you choose, and the magical nights will follow. What is your favorite place for music and dancing in Chicago? Leah Pickett is a pop culture writer and co-host of WBEZ&apos;s Changing Channels, a podcast about the future of television. Follow Leah on Facebook, Twitter and Tumblr.